Nigeria’s president, Muhammadu Buhari and Zimbabwe’s strongman, Robert Mugabe have both gone for medical treatment twice this year and Twitter followers have not failed to notice. 93-year-old Mugabe has gone to Singapore to treat an undisclosed illness while 74-year-old Buhari is in London also due to an undisclosed ailment. Buhari- London…. 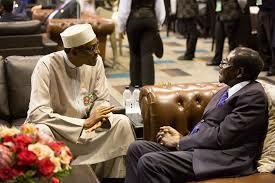 Mugabe – Singapore… Does that make every hospital in Africa below standard #Confused. Mugabe in Singapore and buhari in London! Both on medical vacation!!! Such tireless leaders! !